0.0015" - 0.003" - 0.006"
96" x 72" x 96"
The intuitive FAGOR 8055i with interactive graphics and ICON based conversational programming understands machinists mind very well. Hence It doesn’t require any prior programming knowledge to operate. It is like “operating a manual machine with full power of CNC”. Unique screen design based on “One operation one Screen” prompts you to fill in the blanks and press cycle start. 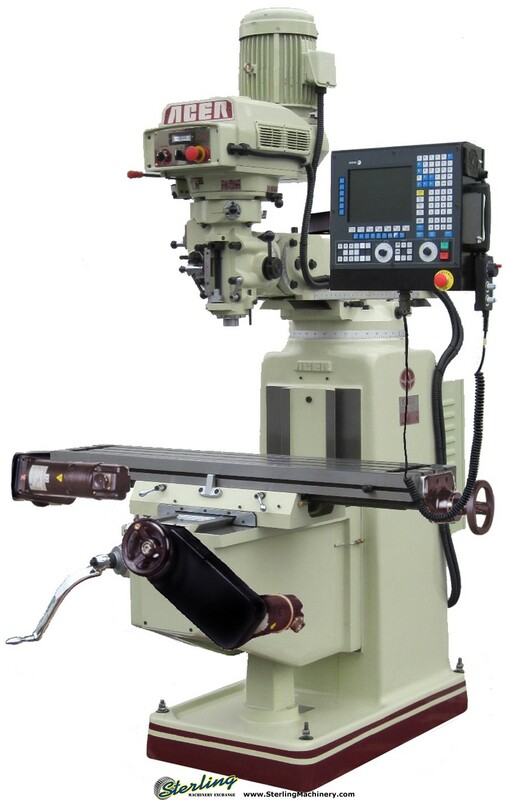 This exceptionally efficient SHOP Floor Programming system is very easy to use. The Fagor 8055i comes standard with Profile Editor a mini CAD-CAM system which helps you generate even complex profiles with ease. You can also program in G code using the full key board or use the DXF converter to import a program. The 8055i is expandable and the possibilities are endless! ♦ Interactive ICON based conversational programming system. ♦ One screen - One operation, Fill in the blanks & press cycle start. ♦ No limit to the number of programs in memory! ♦ Built in Mini CAD/CAM system. ♦ 11” Color TFT LCD screen. ♦ Numerous “Easy to Use” conversational cycles (36). ♦ Tool path and Solid graphic simulation standard. ♦ (3) 31 in/lb. DC motors and drives with option for AC Brushless or 41 in/lb. upgrade. ♦ WinDNC (DXF converter) and Engraving. ♦ FULL G-code programming with interactive help screens. ♦ Smart Z axis quill for CNC and manual mode with scale-fed DRO feedback. ♦ Full CNC package includes Ball Screws and Motor Brackets for all axes. ♦ Fagor 8055i/A-MC CNC’s give you 4th axis capability out of the box!